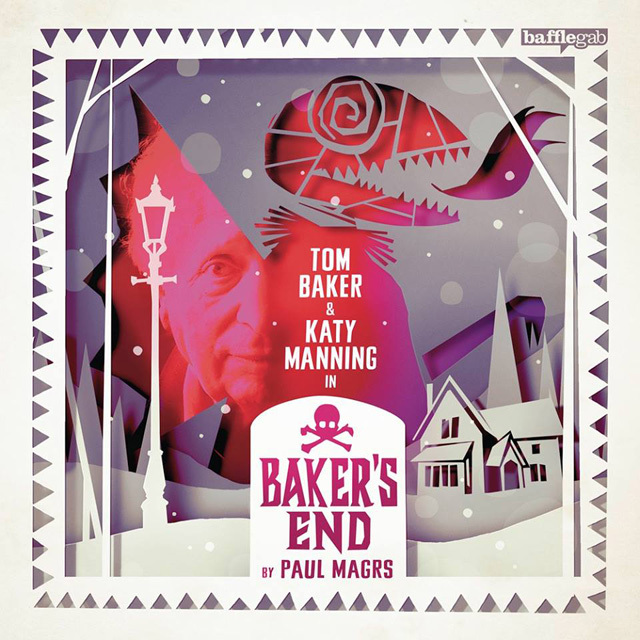 BAKERS END: THE KING OF CATS Review | Warped Factor - Words in the Key of Geek. Tony’ll be up on the roof if you need him. Yes indeed, here I am, back again and twice as bouncy! No no, not really – breathe out, the curse of 2016 has yet to touch the man who was (and still is) the Fourth Doctor. To be absolutely honest, and to paraphrase an idea expressed in Paul Magrs’ new audio story, it’s hard to think of Tom Baker doing anything so ordinary, so fundamentally dull and drab as dying – and hurrah for that, say we at WarpedFactor. Obituaries are such loathesome things to write, we’d be obliged to Mr Baker if he would punch the Grim Reaper on the nose any time Old Bony comes near, thank you very much. But while the real Tom Baker (whoever that is) is still very much with us, his sense of humour has always been somewhere on the borderline between mordant and morbid, which is how he comes to be playing an allegedly heightened version of himself in this new series by Magrs, for Bafflegab Productions. And the heightened version of Tom Baker is dead, prompting generations of stars of stage, screen and rubber monster costume to flock to the village of Happenstance (twinned with the Twilight Zone) to pay tribute to the great, grinning force of nature that he was. Magrs of course has plenty of form taking the Fourth Doctor out of what might be considered his usual place and time – his is the brain behind the Nest Cottage Chronicles, which saw the Fourth Doctor settled down in a village, with a housekeeper. Heightened-Tom lives in village, with a housekeeper, but that’s pretty much where the similarities end. Baker’s End is far, far weirder. And again, say we, hurrah for that. The village of Happenstance is stone barking mad, as indeed are most of its inhabitants, and the plot is pretty loopy too – Tom, before dying, started wittering about fans who weren’t fans, and TV license detector vans with x-ray beams that could see inside your house, and the postmistress being in contact with the aliens through an ariel on her roof. Most of all, he was worried about people being replaced by doppelgangers. Katy Manning stars here as Tom’s ex-companion actress, Suzy Goshawk, down for the funeral just before Christmas, but something quickly starts to smell rotten in the state of Happenstance – and it’s not the corpse of our beloved Baker. In fact, people have various accounts of how he actually died, despite nobody, when pressed, being able to confirm they saw it happen. When all the rest of the London crowd apparently get the last train out of Weirdsville, it leaves Suzy trapped alone with Susan Jameson’s Mrs Frimbly, the housekeeper from Hell as the snow descends (it always snows at Christmas in Happenstance). Then the vicar, the Reverend Ailing (played by David Benson) begins to notice odd things happening, odd flashes of…is that a giant cat?...out of the corner of his eye. Are the people of Happenstance all doppelgangers? Is Tom Baker really dead? Who or what is the King of Cats? Why must Clacky the Dragon be appeased by the twerking of ageing buttocks? And which is the best saint to drop on an advancing enemy from a great height? All these questions and more are answered across the length of this deliciously bonkers story. None of the answers make more than a passing pretence at sense, but they do at least appear, so the storytelling’s as sound as you’d expect from Paul Magrs. Stylistically, this is Alice in Wonderland meets Willy Wonka in Tom Baker’s brain, and beats the living crap out of him. There’s that tone, familiar from both the Alice stories and some of Dahl’s darker, more fun adventures, of something really quite creepy and unpleasant going on beneath the surface of what is otherwise a dementedly silly, very funny, bouncing off the walls storylines. Linguistically, too, it’s Carroll meets Dahl meets Baker, as Magrs sees him. The tales are tall, the language frumious and fruity, with plenty of nonsense that sounds like much more fun to say than any of your boring, normal, human words. You half expect a Bandersnatch or a Jabberwock to come trolling through the borogoves pretty much throughout, and when the mystery of the King of Cats finds its solution, there’s a sense of the absurdity escalating to a whole other level of whoah. In the event that you’re not a big fan of whacky, zany surrealist mayhem, don’t panic – yes, this story’s madder than a bag of cats, but in Katy Manning, we have a reasonable, what-the-heck, Jo Grantish anchor in the world gone mad. Why should you tear yourself away from all your usual geek-obsessions and take the time to invest in a new one? Especially a new one as whirly-twirl and ghoulishly glorious as this one? Imagine Tom Baker. Imagine everything you know about Tom Baker. Then hit it with one of those sixties radioactive enlarging rays. Free Tom Baker from the constraints of drama and make him fill the shoes of a heightened version of himself in a world gone weirder even than usual. Add Katy Manning as your guide into the madness, Susan Jameson playing gruesome and funny on a knife-edge, and a story with its roots in Doctor Who, but its sensibilities in Carroll, Dahl and Magrs. You know that’s worth taking a chance on. And once you’ve listened to The King Of Cats, you’ll be back to Baker’s End before you know it.